Washington, D.C.--Celebrity parenting expert "Super Nanny" made an appearance in the nation's capital, by popular demand, in an attempt to impose some discipline on what has become an incompetently-run attempt at unprecedented top-down control of America's electorate. 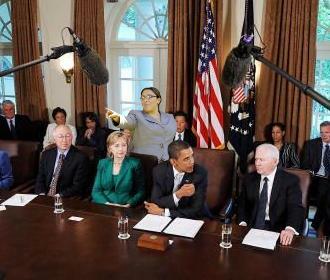 In the morning, Super Nanny was seen scolding House Speaker Nancy Pelosi for selectively ignoring rules that require new government programs to paid for before they pass. "You must not deviate from the prescribed routine," she said, "lest you lose all credibility with the electorate you're trying to nanny!" At one point during the afternoon, Super Nanny bent down next to President Obama, who's violated a host of campaign promises, and looked him sternly in the eye. "Never say anything you are not willing to follow through with!" she said. And by the evening, she was seen with Senator Patrick Leahy, Democratic Chairman of the Senate Judiciary Committee who recently admitted he had not read the newly-enacted financial services bill that shields the Securities and Exchange Commission from public requests for information. "Choose your words carefully!" she barked. Before leaving Capitol Hill, the renowned discipline instructor told reporters that most of the current Congress was due for a "time out" -- two years for House Members, and six for Senators, who "tend to be a bit more pompous in their misbehavior."